What is Distributed Sensing? Fibre Optic Monitoring System (DTS & DAS)| Silixa Ltd. Distributed sensing is a technology that enables continuous, real-time measurements along the entire length of a fibre optic cable. Unlike traditional sensors that rely on discrete sensors measuring at pre-determined points, distributed sensing does not rely upon manufactured sensors but utilises the optical fibre. The optical fibre is the sensing element without any additional transducers in the optical path. The interrogator operates according to a radar-style process: it sends a series of pulses into the fibre and records the return of the naturally occurring scattered signal against time. In doing this, the distributed sensor measures at all points along the fibre. As the fibre is the sensor, it is also a cost-effective method that can be easily deployed even in the harshest and most unusual environments. Distributed sensing is usually used for acquiring temperature, strain and acoustic data. The optical fibre is made of pure glass (silica) as thin as a human hair. It consists of two parts: the inner core and the outer cladding. Cladding is a glass layer made up of lower refractive index glass to maintain guidance of light within the core. Both parts are encapsulated by a single or multiple layers of primary polymer coatings for protection and easiness of handling. There are two main types of optical fibres according to communication application standards. These are the singlemode, intended for long haul communications, and multimode for short haul communications. Multimode fibres have a larger core (45 to 50 microns) than single mode fibres (8-10 microns), allowing more light modes to propagate. The typical diameter of an optical fibre is 125 microns that increases to 250 microns if we include the thickness of standard acrylate coating. Multimode fibres are usually used for temperature sensing, whilst singlemode fibres are mostly used for distributed acoustic sensing or strain sensing. Although Silixa’s temperature and acoustic sensors can be used with either single mode or multimode fibre, the performance of the temperature system is optimised when it is used with multimode. The performance of the acoustic sensor is optimised with single mode fibre. Fibre optic cables can contain many fibres, which can be either a single type or a combination of both. The cable construction depends on the installation, operation and application conditions. How does Distributed Temperature Sensing (DTS) work? The underlying principle of the ULTIMA™-DTS is Raman based temperature measurement combined with Optical Time-domain Reflectometry (OTDR). A short pulse of light is launched into the fibre. The forward propagating light generates Raman backscattered light at two distinct wavelengths, from all points along the fibre. The wavelengths of the Raman backscattered light are different to that of the forward propagating light, and are named “Stokes” and “anti-Stokes”. The amplitude of the Stokes and anti-Stokes light is monitored, and the spatial localisation of the backscattered light is determined through knowledge of the propagation speed inside the fibre. The amplitude of the Stokes light is very weakly dependent on temperature, whilst the amplitude of the anti-Stokes light is strongly dependent on temperature. The temperature profile within the optical fibre is calculated taking the ratio of the amplitude of the Stokes and the anti-Stokes detected light. A typical system is characterised by the spatial and temperature resolution. The spatial resolution, is the minimum distance of the sensor to measure a step change in temperature along the optical fibre. The temperature resolution is a measure of the precision to distinguish the absolute temperature. The temperature resolution depends on the measurement time and the launch pulse repetition rate. The laser pulse energy and duration are accurately controlled and optimised at the measurement maximum length to provide the best available temperature resolution performance within acceptable accuracy limits. As the sampling time is increased, the temperature resolution is improved and resolved temperatures become more accurate. The Ultima DTS samples date at quite high rates enabling data to be recorded at intervals as small as 12.5 cm with a temperature resolution as low as 0.01o C. There is a performance trade-off between temperature resolution, spatial resolution, measurement time and fibre length. The spatial resolution and averaging times are user defined within the ULTIMA DTS software, and may be varied by the operator as required. How does the intelligent Distributed Acoustic Sensor (iDAS™) work? 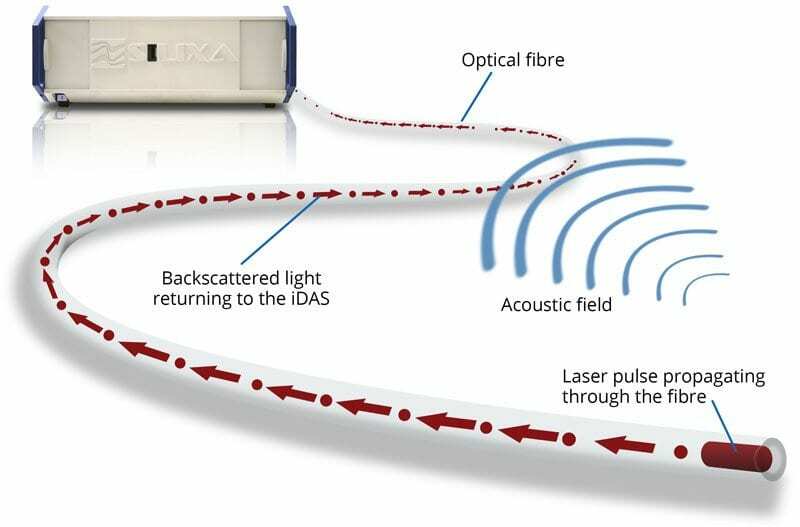 iDAS technology measures the acoustic signal at all points along many kilometres of the optical fibre as if it were a string of microphones. 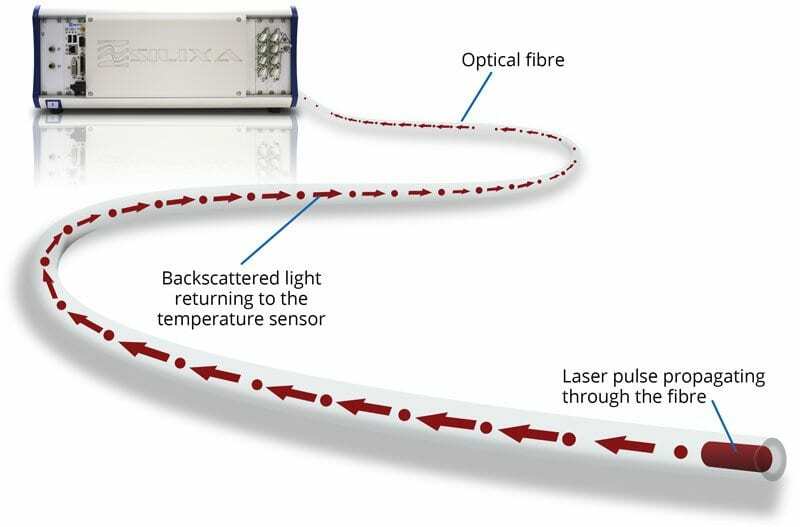 The intelligent Distributed Acoustic Sensor works by injecting a pulse of laser light into the optical fibre. As this pulse of light travels down the optical path, interactions within the fibre, which result in light reflections known as backscatter, are determined by tiny strain events within the fibre which in turn are caused by localised acoustic energy. This backscattered light travels back up the fibre towards the iDAS where it is sampled. The time synchronisation of the laser pulse allows the backscatter event to be accurately mapped to a fibre distance. Once the pulse of light has travelled to the end of the fibre and any reflections have travelled back to the interrogator the fibre can be considered to be “dark” and a subsequent laser pulse can be introduced without the risk of interference. For each laser pulse the entire fibre distance is sampled at each point along the length, typically at every 1 metre. The result is continuous acoustic sampling along the entire length of the optical fibre without cross talk and with a frequency range from milli-hertz to over 100kHz and a dynamic range of over 120dB. How is Silixa’s iDAS different from other distributed acoustic sensors? Silixa’s iDAS is a true acoustic sensor because it reproduces sound faithfully in phase, frequency and amplitude. This capability is critical for the advanced processing techniques used in many of the applications and is not common to several DAS systems on the market currently which may not offer the amplitude stability or phase accuracy required in advanced processing. A key differentiating feature of Silixa’s iDAS is the ability to perform measurements equally well on both single-mode fibre and multi-mode fibre, this allows Silixa to retro-fit an iDAS to an existing multimode fibre installation or to utilise DTS multimode cables to perform the full scope of iDAS services. What are distributed sensing systems used for? Distributed sensing systems have been developed for the oil and gas industry to assist reservoir engineers in optimising the well lifetime. Nowadays they find a wide variety of applications as integrity monitoring tools in process vessels, storage tanks and piping systems offering the operator tools to schedule maintenance programs and maximize service life. Distributed fibre optic monitoring offers high spatial & temporal profiling over large surfaces, long lengths and at locations where conventional point sensing is not applicable or cost effective.